In industrial or commercial settings where fine detail work is required on small or intricate parts and components, miniature brushes are used to clean, paint and polish surfaces. These brushes can be used by hand, but some have attachments so that they can be used with a drill or some other power tool. Miniature Brushes In industrial or commercial settings where fine detail work is required on small or intricate parts and components, miniature brushes are used to clean, paint and polish surfaces. These brushes can be used by hand, but some have attachments so that they can be used with a drill or some other power tool. Miniature brushes are used by artists to add the finishing touches to a craft or painting because their small tips make it possible to add very small details. Miniature applicator brushes can be used to apply a coat of paint or sealant to a small part and they make it very easy to cover even the tiniest spaces on the surface. In industrial settings like factories and fabrication plants, miniature brushes are used to clean equipment or restore parts to their original function and appearance. A variety of materials can be used to create the brush, from wire to plastic to synthetics. The softest material possible is usually chosen for polishing applications, while heavier more harsh materials like stainless steel wire are need from deburring and cleaning contaminants off of metal surfaces. Sometimes large industrial companies will need to have custom miniature brush manufactured for use with their equipment or for a particular finishing application on one of their products. Engineers at most major brush companies can design a miniature brush that meets the specifications of their clients to create the perfect cleaning or polishing solution. 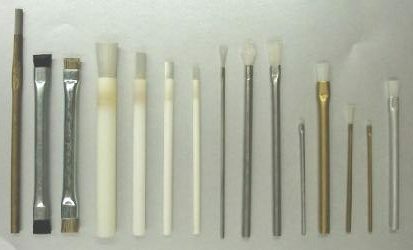 Miniature brushes are made to be used in very small spaces, and sometimes the standard sizes might still be too large for the unique production needs of business. Artist studios, welding shops and auto detailing centers all need miniature brushes to put the finishing touch on their work and take care of the small details.